There are three basic types of liners to choose from when you decide it's time to reline your chimney - Easy-Flex, Heavy-Flex, and Rigid. 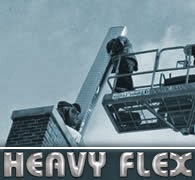 Easy-Flex and Heavy-Flex liners both offer some adaptability; the former is a light and flexible liner, while the latter is constructed with a heavier material but will still yield flexibility. 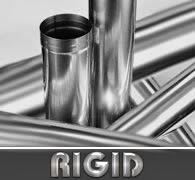 Unlike the other two, Rigid liners have a fixed construction. The traditional rigid liner must be assembled into sections after purchase. Continue reading to find an in-depth analysis of the three types of liners. This is the most popular liner in the market today. 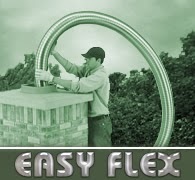 Over 85% of chimney reline projects today use the Chimney Champion Easy-Flex liner. Professionals and home owners choose this material due to its light weight and ease of installation. Don't let the terms "light" or "easy' mislead you, however; this liner has the same lifetime warranty as the Heavy-Flex and Rigid liners. The Chimney Champion Liner is 100% UL Listed and approved in the USA and ULC approved for Canada. The liner is .006" thick, making it the perfect combination of strength and durability, while maintaining its light flexible properties. Easy-Flex liners are recommended for all fuel types and can be made in four varying size shapes. The Chimney Champion Heavy-Flex Liner is built to last and is used in the most extreme harsh conditions of solid fuel burning such as wood or coal. Don't be shy when scrubbing it clean with your toughest wire brush; it can withstand a beating. Even though the liner is flexible, it is recommended for mostly straight chimneys and the components for this liner must be screwed or riveted together. The Heavy-Flex liner is smooth on it's inside walls, making it more difficult for creosote to build up inside. As mentioned before this liner is extremely heavy and would require help to lower the liner into the chimney using a "lift" or a top-mounted winch to pull the liner up the chimney. This kind of liner is 100% UL Listed and approved in the USA and ULC approved for Canada. It is also available in four varying size shapes. The inside walls of the Rigid liner are extremely smooth and make it very difficult for creosote to build up on. It will withstand the harshest conditions of solid fuel burning, as well as withstanding rigorous cleaning from a stiff wire brush. Rigid liner must be assembled in sections as it is lowered into the chimney. It is recommended for straight and preferably short chimney runs.